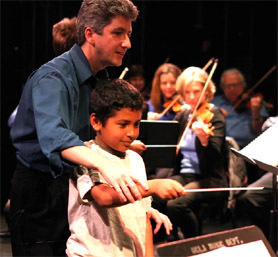 This year the Music Performance Trust Fund presented over 2,000 live, admission-free musical programs. An impressive figure, although considerably lower than in previous years, due to our loss of income caused by illegal downloading and piracy. Nevertheless, the Fund remains the largest provider of free, musical programs for audiences representing every ethnic, economic, social and age group. Our music reaches deep into communities touching the lives of so many; bringing joy to the lonely in nursing homes, bittersweet memories to our vets, hope to at-risk and incarcerated young men and women and song to children-many who have never experienced live music. “Where the Passions of Jazz meet the Power of the Orchestra”, this 72-member professional ensemble based in Los Angeles, works with outreach partners: the Music Performance Trust Fund, The World Stage, Harmony Project, the California State Summer School for the Arts and local elementary schools, to inspire the next generation of listeners through specially designed Family Concerts and Outreach Programs targeting an audience from underserved communities. This past summer the MPTF supported the 80th Anniversary celebration of George Gershwin’s Rhapsody in Blue presented by the Symphonic Jazz Orchestra at the Ford Amphitheatre. The concert featured pianist Bill Cunliffe with bassist Edwin Livingston and drummer Peter Erskine in the original 1924 orchestration of this American masterpiece. The Orchestra has also commissioned and premiered seven new works by both established and emerging composers since it was established in 2002.